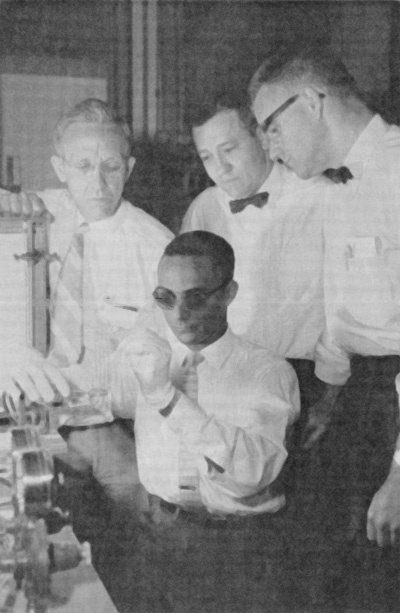 Alton Foote, Stanley Ackerman and Edward Zubler (standing l-r), watch Frederick Mosby (seated), tip-off a tungsten halogen lamp in 1959. "I was assigned to the project and told 'see what's going on, see what's making it work or not work.'" "When we were developing the lamp, we could see just millions and millions of lamps because that's what we sell in A-lines. I felt that if we ever got to the point where we knew how to control things and make it, we would replace standard incandescent lamps with halogens." In late 1953, Elmer Fridrich and Emmett Wiley at General Electric showed that placing iodine in a quartz heat-lamp prevented evaporated tungsten from depositing on the inner bulb wall. Unfortunately, their success was sporadic -- some of their tungsten halogen lamps worked and others didn't. After several months, Alton Foote, head of Nela Park's Large Lamp Department, assigned chemist Edward Zubler to discover exactly what was happening inside Fridrich and Wiley's lamps. In 1955 Zubler was joined by engineer Frederick Mosby who began looking at the equipment and procedures needed to turn a laboratory experiment into a marketable product. It turned out that trace impurities caused the initial successes and after three years of work, Zubler and Mosby had a lamp that surprised the industry. They reported in a 1959 paper that the tungsten halogen lamp showed, "virtually 100% lumen maintenance," about 20% better efficiency than regular incandescent lamps, and a "considerable increase" in life. All in a tubular lamp much smaller than ordinary lamps. At first, GE management considered tungsten halogen a "niche product" for "special applications." More expensive than regular lamps and requiring new fixtures, tungsten halogen was well suited for hard-to-reach places requiring a small light-source. Wing-tip marker lamps were an early application and this brought Stanley Ackerman of the Miniature Lamp Department into the picture. With electricity prices low, the thought of replacing ordinary "A lamps" (the industry designation for common light bulbs) with tungsten halogen seemed uneconomical. Despite this, Mosby received a patent in 1966 for just such a replacement lamp though GE did not pursue it. Rising electricity prices and the energy crisis prompted GE to reevaluate tungsten halogen in the 1970s. The efficiency of tungsten halogen attracted an increasing amount of attention and the technology began displacing some regular lamps. That displacement process accelerated with the Energy Policy Act of 1992. Several regular incandescent lamp types (notably spot-lights and flood-lights) were replaced by tungsten halogens. Mosby's early speculation about halogen lamps may yet come to pass.